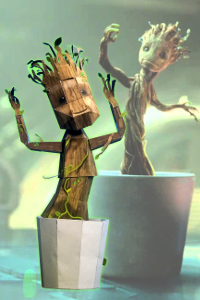 This paper craft model is for a dancing BABY GROOT papercraft template. Groot has been in the Marvel Comics since the 1960's. An extraterrestrial, sentient tree-like creature, the original Groot first appeared as an invader that intended to capture humans for experimentation. But he became more famous in his appearance as one of the main characters in the movie Guardians of the Galaxy and was voiced by Vin Disel. To give due credit, this papercraft model template is designed by Richenna King. 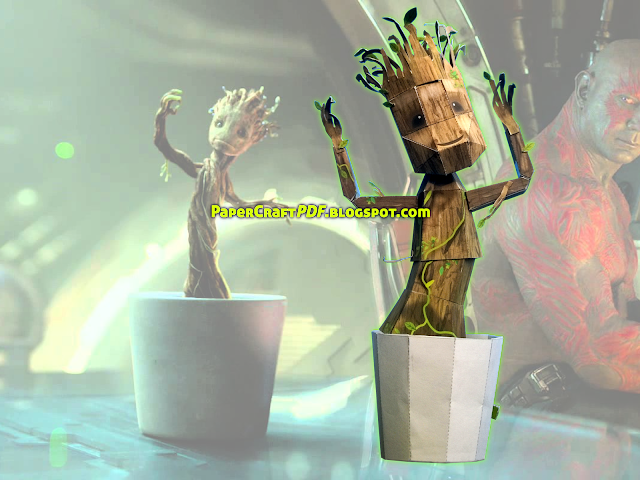 And this Dancing BABY GROOT papercraft model template is available in PDF versions only with a few download links to choose from below. The character was reintroduced as a heroic, noble being in 2006, and appeared in the crossover comic book storyline "Annihilation: Conquest". Groot went on to star in its spin-off series, Guardians of the Galaxy, joining the team of the same name. Groot has been featured in a variety of associated Marvel merchandise, including animated television series, toys, and trading cards. Vin Diesel voices Groot in the 2014 film Guardians of the Galaxy and its 2017 sequel, Guardians of the Galaxy Vol. 2, and Krystian Godlewski plays the character via performance capture in the first film. Since his film premiere, Groot has become a pop culture icon, with his repeated line "I am Groot" becoming an internet meme. A different Groot played a part in Annihilation: Conquest, at which time it was shown Groot may be the last remaining member of the Flora Colossi, and was under arrest by the Kree for an unknown reason. Groot earned freedom by joining Star-Lord's strike force, where Groot and Rocket Raccoon formed a bond, Rocket being one of the few beings with the ability to understand Groot's language. Star-Lord's team fought their way through the Phalanx, but after the death of Deathcry the team decided to escape through a drainage pipe that Groot could not fit into. Groot seemingly died, buying the team some time to escape the battle. Groot survived as a sprig offshoot and went on to accompany the team on their continued mission against the Phalanx, but was one of the team members captured by the Phalanx. Groot and the others were freed by Mantis, and escaped back to the lines of the Kree resistance. In time, Groot's body regenerated from the twig, growing back to full size. Groot and the others intended to carry on as part of Star-Lord's team. Groot and the team returned to Hala to prepare another assault against the Phalanx, but their agent Blastaar was captured by the Phalanx and taken to their Babel Spire as he tried to carry Groot's pollen spores. Groot and Rocket Racoon continued their mission by sneaking into the sub-basement of the Babel Spire. When Star-Lord was captured by Ultron, the original plan of laying explosives in the Spire failed, so Rocket Raccoon and Groot needed to come up with a new plan. Groot decided to sprout inside the Spire, growing to colossal size and filling a large portion of the building. Mantis was able to remix Groot's sap in a way as to make it extremely flammable, and again Groot died for the team, this time by purposefully igniting so the resulting fire would destroy the Babel Spire. A cutting of Groot was kept by Rocket Raccoon, though, and Groot was again able to regrow. Groot then joined the new Guardians of the Galaxy (or, as Groot would have it, "Groot and Branches"), and began regrowing under the care of Mantis. When the Guardians reformed, Groot joined with Star-Lord, Rocket Raccoon, Drax the Destroyer and Gamora, whom Groot counted as friends. In March 2015, it was announced that Groot would be getting his very first solo series by writer Jeff Loveness and artist Brian Kesinger. During the 2015 Secret Wars storyline, Groot is with the Guardians of the Galaxy when they take part in the incursion between Earth-616 and Earth-1610. Groot and Rocket Raccoon are killed by the Children of Tomorrow. However, when Peter Quill — one of the few survivors of the incursions from Earth-616 — finds himself confronted by Black Swan in the castle of Emperor Doom, he reveals that he has been carrying a small twig of Groot in his pocket ever since the incursion, slamming it into the roots of the World Tree and causing Groot to transform the giant tree into his body, decimating Doom's castle as the surviving heroes mount their final assault.